The oldest bird in the world has hatched her 40th chick in Hawaii. Named Wisdom, the bird belongs to the Laysan albatross species and has one lifelong mate, Gooo. The news was announced by the Fish and Wildlife Service of the United States. Wisdom has reached the impressive age of 65 years old and is still raising chicks and being productive to her species. Her youngest hatchling was named Kūkini which means in English “messenger”. Kūkini made the first cracks on its egg on February 1, time during which he was being taken care of by its father. Gooo’s name comes from his leg identification band that features the number 6,000. The father took his responsibility very seriously and watched over the egg for two weeks while Wisdom was gathering food for the chick, including fish eggs, squid and small fish. The staff of the Papahānaumokuākea Marine National Monument in Honolulu (which is the largest conservation area of the United States), has written that after Wisdom stepped in to take care of Kūkini, Gooo marched for quite some time before taking flight. He is expected to return in a less than a week, since the hatchling constantly requires fresh food. 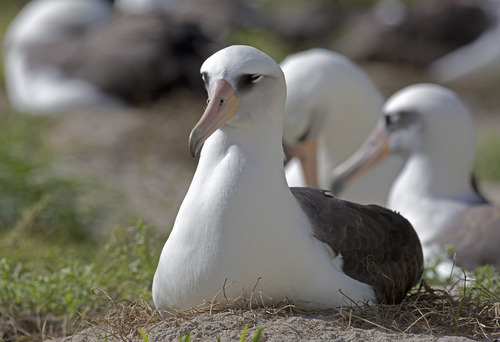 Wisdom, Gooo and Kūkini are living in one of the largest nesting colonies of albatrosses in the world, located at the Midway Atoll Refuge, which houses about one million birds of this kind. Biologist Chandler Robbins was the one who discovered Wisdom and he banded her back in 1956 on Midway Atoll. It was only 46 years later that he managed to find her again at the same location. Wisdom is estimated to have been about five years old when Dr. Robbins first found her, and thus by now she must be older than 65. Hawaiian conservationists that have monitored her believe she has raised about forty chicks during her lifetime, and has flown for over three million miles. The Midway Refuge manager, Robert Peyton, has stated that Wisdom remains a symbol of hope and inspiration. Albatrosses constantly face multiple dangers such as being invaded by other aggressive bird species, being captured in fishing nets, choking on debris from the ocean and losing their breeding ground because of the degradation of the environment. As the oldest bird in the world has hatched her 40th chick, we can only admire its extraordinary ambition and drive to live, in spite of all the impediments that our world poses today to many animal and bird species.